When will be Hoarder SOS next episode air date? Is Hoarder SOS renewed or cancelled? Where to countdown Hoarder SOS air dates? Is Hoarder SOS worth watching? Curtis Dowling and Joanna Riley help people with an extreme build-up of clutter to clear out their properties and raise money from the sale of their items. Curtis, Joanna and Marianne are in Blackpool with a theatrical costume maker and his actor partner trying to persuade them to part with a mountain of clothes and antiques. In Cumbria they try and help a woman who has filled her house with the contents of a hotel she used to run. Collectables expert Curtis Dowling and housekeeper Marianne Cammack are in Essex helping a woman sell stuff she bought in New York in the 1960s, but will her items still have timeless appeal for potential buyers? In Elgin they're tasked with clearing out a collection of royal memorabilia and novelty china - but can the owners actually part with collections built up over decades? A woman in Lincolnshire sends out an SOS to clear the clutter taking over her home. She desperately wants space on the sofa to have a cuddle with her husband, but can the team's effort make room for romance? 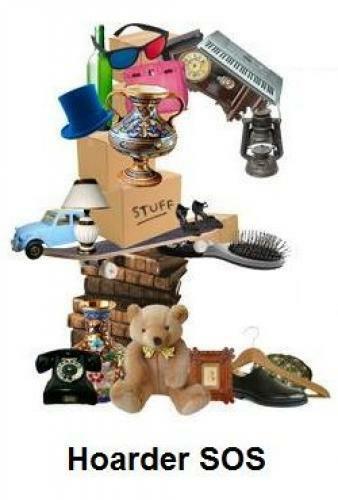 In Newcastle upon Tyne a teacher wants to clear out rooms brimming with items inherited from her late father. Hoarder SOS next episode air date provides TVMaze for you. EpisoDate.com is your TV show guide to Countdown Hoarder SOS Episode Air Dates and to stay in touch with Hoarder SOS next episode Air Date and your others favorite TV Shows. Add the shows you like to a "Watchlist" and let the site take it from there.